Gold banknotes - one more proof that gold is the money for the 21st Century! Last year, the American company Valaurum started the production of notes using a fractional gram's worth of gold between layers of polyester for its protection, named “Aurum”. A standard note is 404nm thick, similar to a U.S. dollar bill. These banknotes are a thin sheet of 24-karat gold artistically printed, flexible and lightweight, but the most outstanding feature is probably its familiarity with paper banknotes in form and weight. That would be convenient if someday they enter into circulation. “Aurum”enjoys similar qualities to coin and gold bars, as they all can be exchanged, stored, have a price depending on the market and can be melted at any moment. 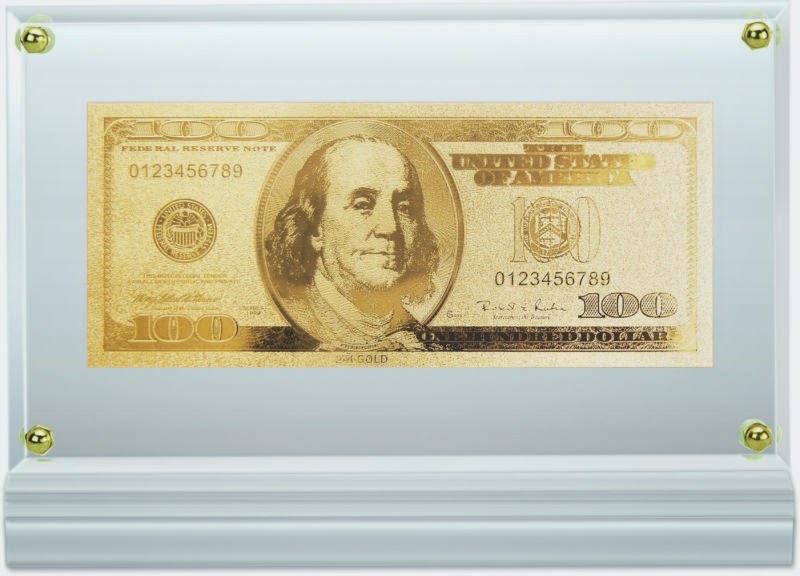 Gold banknotes hold an advantage and that is its affordability for all budget sizes. On the other hand, they are not fit to create a gold reserve. The company has future expectations and international patents pending in several continents, including a negotiation with a Central bank to replace its currency with gold banknotes. What result would there be if a gold backed monetary system is re-established? At the present time the future is unclear, so now it is time to ensure stability and financial well-being. For that hundreds of thousands of people have chosen a higher valued product – investment gold bars of Emgoldex with which they create their own gold reserve. For more than 5 years, the clients have the opportunity to buy gold bars in the online store of Emgoldex with the best purchasing conditions! Share this news about the world market of gold in your social networks and bring people the best opportunity of today!